We are a bacon-lovin family! Not turkey bacon...the real stuff! 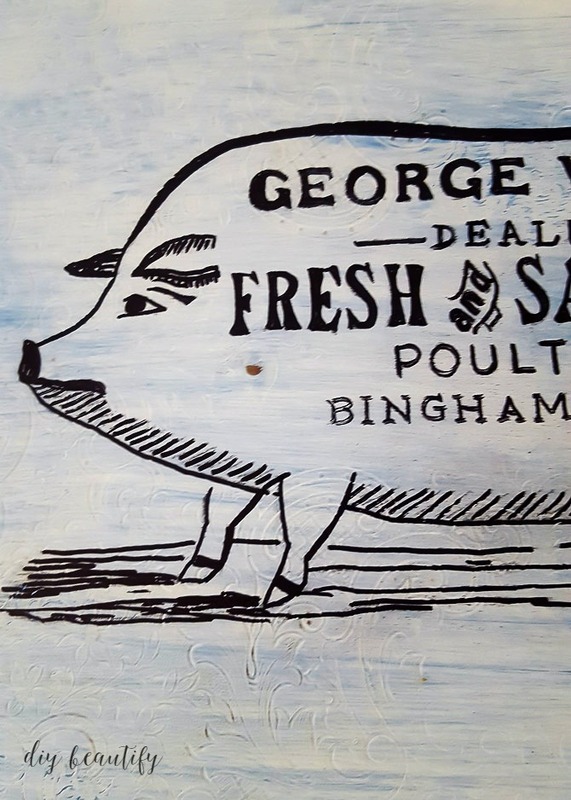 And every bacon-loving family needs a tray like this, with a vintage pig graphic that is 'painted on' using a Sharpie! My m-i-l is the Queen of theme gifts. As my boys have gotten older and harder to buy for, she looks for themes to make it a little easier (ie: favorite sports team, favorite color...favorite food). This is where bacon comes in. My middle son has been receiving bacon gifts for the last couple of years...wild and unusual bacon gifts...bacon popcorn, bacon gum, a bacon-shaped pillow, bacon band-aids, bacon-flavored toothpaste...well, you get the idea!! What does that have to do with today's post? Nothing really :) Except that when I was searching for a graphic to use on my tray and saw this pig, I knew it would be perfect in my kitchen! And my boys might even appreciate it! This post may contain affiliate links. Find my complete disclosure policy here. I recently posted my chalk-painted silver trays. 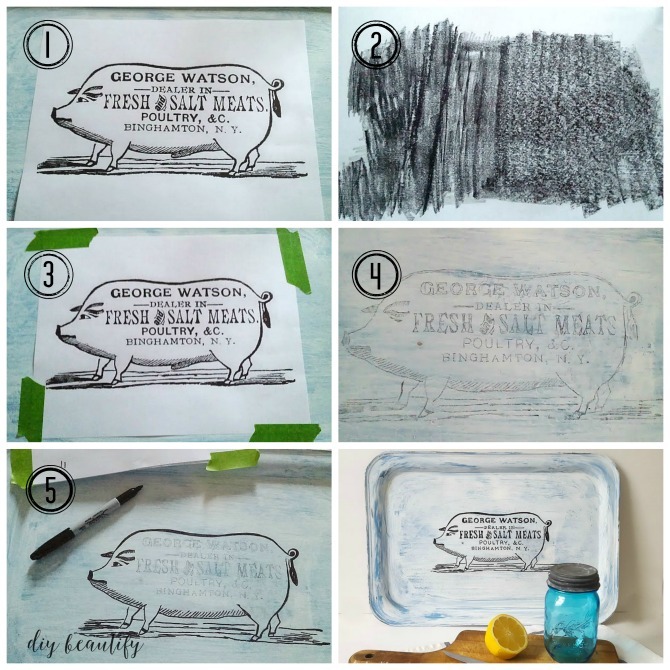 In that post, I showed you how easy it is to antique inexpensive trays with chalk paint and furniture wax. During a run to the thrift store this week, I came across another silver-plated tray, this one large, rectangular and heavy. I painted the tray a custom blue, attempting to match my blue and white dishes...but I wasn't thrilled with the results. So I dry-brushed some white chalk paint on. The color was much softer and more distressed looking, but it still looked too plain. A graphic is what it needed. And this is where the pig came in. 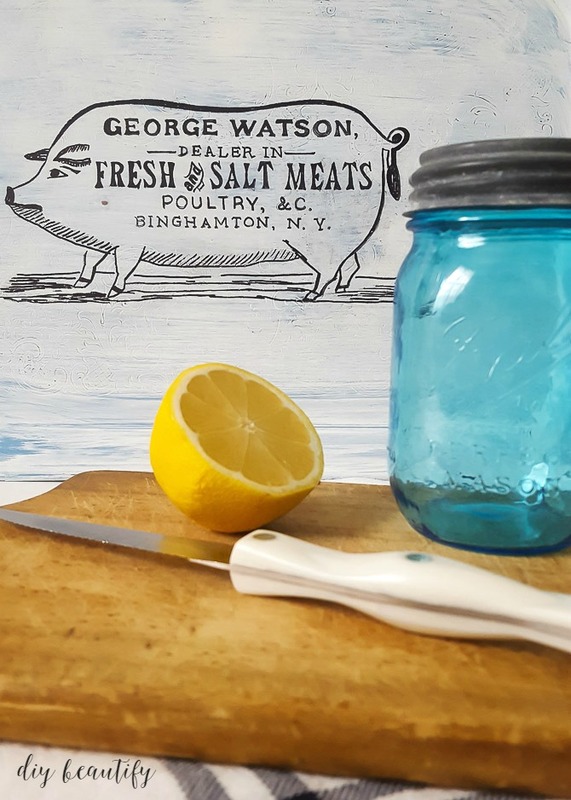 I found the pig graphic over at The Graphics Fairy. The full size PDF was too large for my purposes so I resized it to fit a regular 8 1/2 x 11 sheet of paper and printed it out. The words were the most difficult part of the graphic because I had to be more precise with them, but, having done this technique with a paintbrush as well, I have to say that the Sharpie is definitely easier. And here is my painted tray, all finished. 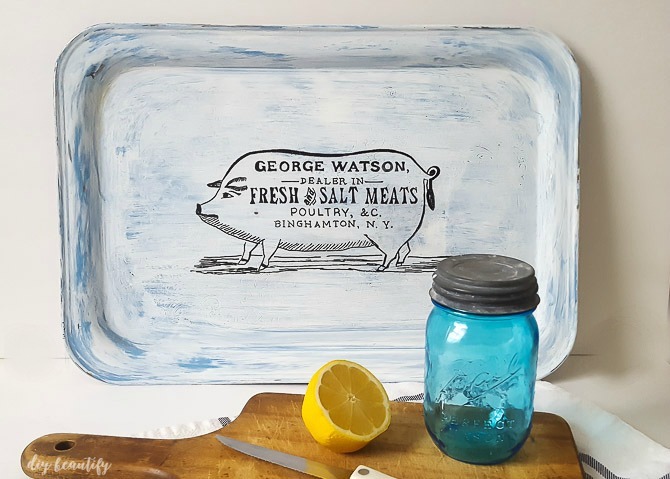 The vintage graphic adds a farmhouse feel to my painted tray. 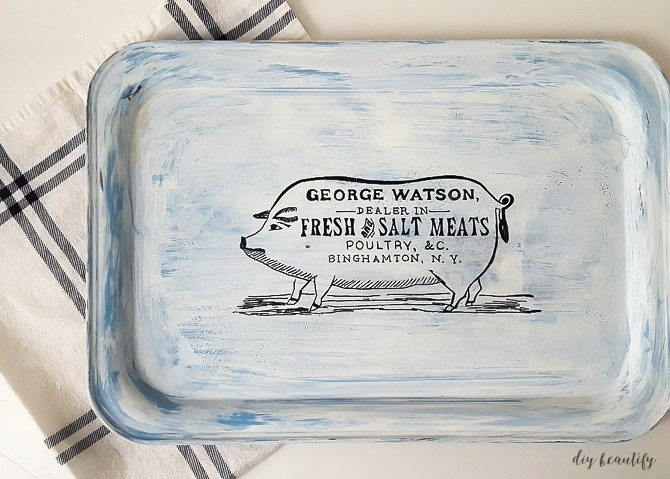 The blue tray with white brush strokes now looks a little like an old, chippy tray that's been around for years, and is well-used! I'm not sure yet if I'll antique it with dark wax or not. I'm going to live with it as it is for now and decide later. UPDATE: as I'm using this tray for decor purposes only, I have not applied any wax to it. Mmmm,and now I'm craving bacon! I'd love to know if you try this project and what you think about using a Sharpie to 'paint' a graphic. What a fun idea! And it turned out just great! I found you via Cozy Little House's Welcome Wagon. Come by and visit me at Home In Douglas! This is so cute Cindy and I just happen to have some old silver trays.....bam. I'm just not sure I'll be able to figure out how to resize this to an 8 1/2x 11 1/2 paper but I'm game. If you have tips share please. Thank you! If you have the program Paint, open it up in there and you can resize it quite easily :) Good luck! It came out adorable! I love sharpies, sometimes I use them when painting. OMG this is the coolest trick ever! I mean this is brilliant! Haha, it's a girl! :D Love the tray, great job! Hi Cindy - oh my, I absolutely love the tray, the graphic and the awesome tips on making this! 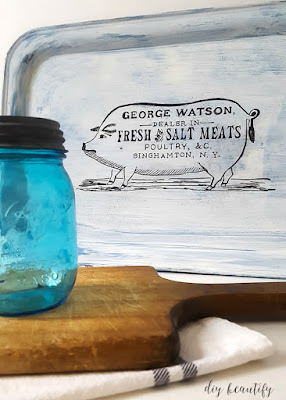 I have an old bacon press that belonged to my grandparents and your graphic would be a great partner. Now, I might have to think about giving some old trays new life! Thank you so much for sharing at Best of the Weekend and I'm planning to feature it this Friday - plus pinned, of course! :) Hope you are having a wonderful week! 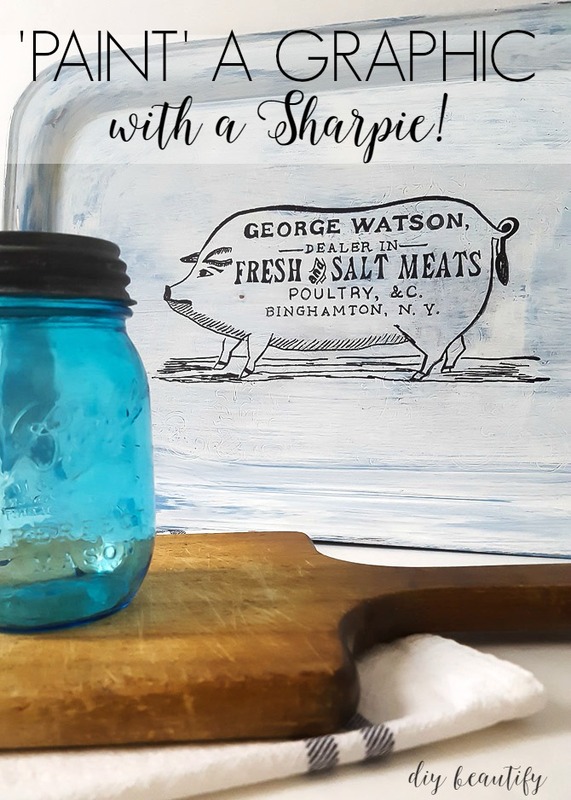 Thank you Cindy - so excited to be featured on Little Miss Celebration :) Yes, a painted tray with the little pig graphic would be a great addition to your kitchen! Yes!! I love this idea. Thanks for sharing. I can't wait to try this! Sharpies are quickly becoming my new go to! Thank you, it's wonderful to use cheap office products, isn't it?? 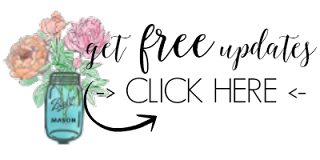 Thank you :) Welcome to DIYbeautify!! Thank you so much for sharing your beautiful project on The Inspiration Board at homework. You were featured today! Found you over at Kick of Time Tuesday. I LOVE this tray with the Sharpie transfer. Thanks for sharing. Thank you so much Judy! It is such an easy way to get the painted look!! I hope you try it :) Thanks for taking the time to come by and comment! !